I cannot continue describing my On30 layout under the "Pick and mix micro layouts" thread, it's not a series of micros sharing fiddleyards any more, not by a long chalk! 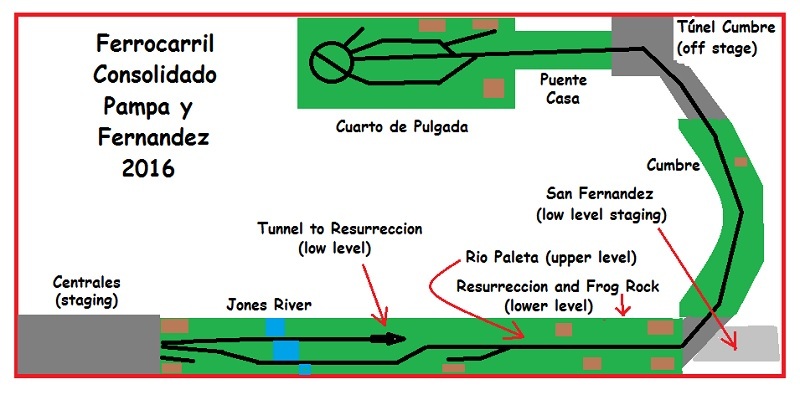 Frog Rock and Resurreccion are still independent scenes but Rio Paleta and Jones River have merged into one large scene. Huge by my standards in fact! 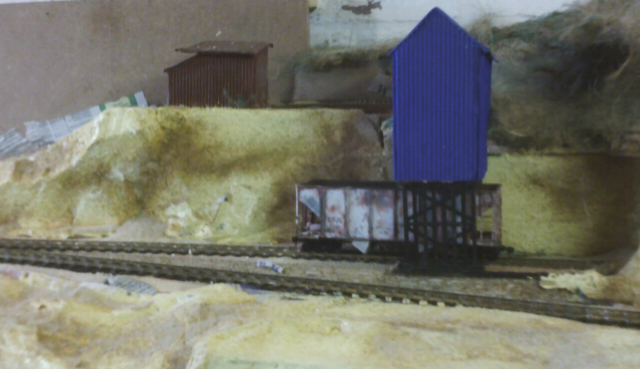 So I'll start this new thread for it and the pick and mix thread will remain in use for my other (smaller) layouts. 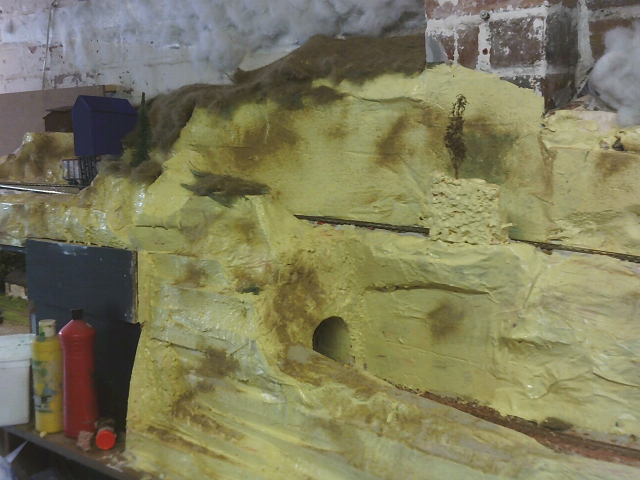 I've been working on the scenery today. The mine module needed to be removable from the fixed layout so that I can perform any maintenance and/or repairs that may be required to the tram's fishing line drive system. 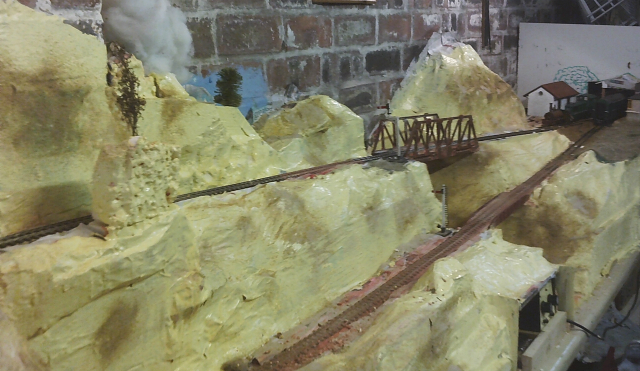 This has been a stumbling block for a few days as I tried different methods of disguising the join, eventually deciding to place it just below the level of the mine tram track instead of level with the FCPyF siding. The results can be seen in the photos below. Exits-to-fiddleyards at Frog Rock (lower level) and Rio Paleta (upper level). 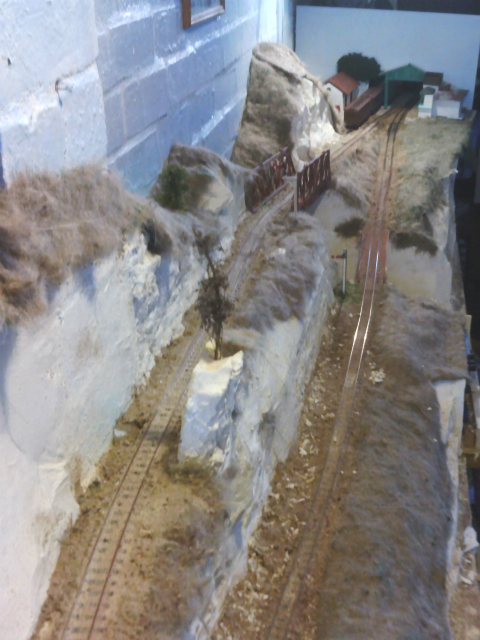 And the exit-to-fiddleyard at the far end of the layout. This structure has, in my eye at least, quite a colonial look to it with the signal box, water tank, train-shed roof and station offices all being combined into one building. Nice to see the FCPyF has its own thread at last! The mountains are looking good, now the newsprint is invisible. Reminds me of a friend who has a large On30 layout, in which the Guardian Mountains play a part. 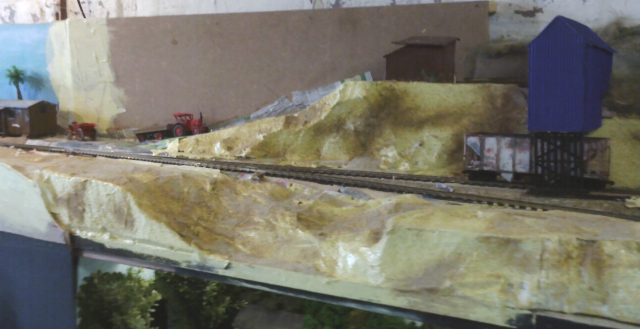 The gradient on the lower incline is not as steep as that on the upper, but it's still probably going to annoy the drivers if the bobby hasn't got the road set up and signals off by the time the trains clear the tunnel. While waiting for paint to dry earlier this afternoon I let my gaze wander around from the upper fiddleyard, across the back window of the garage, lift out bridges over the garden and house doors, a major station on a shelf attached to the house wall above Charlie's OO layout and a re-sited north fiddleyard over the freezer. Daydreaming of course, I'll finish what I'm doing first and anyway a major station would mean lots of points... Far too expensive! Really like the way the new junction station is coming along, Bob, and in particular the way the goods siding sneaks out from behind the train-shed, running under a large tree. When its complete it's going to be a great photo location. Thanks Giles. 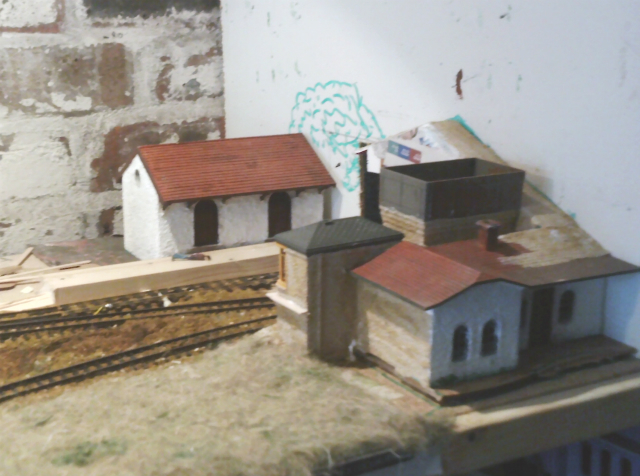 When I was putting this area together I originally had the goods shed in the foreground as the viewblock but it works better with the station buildings at the front. 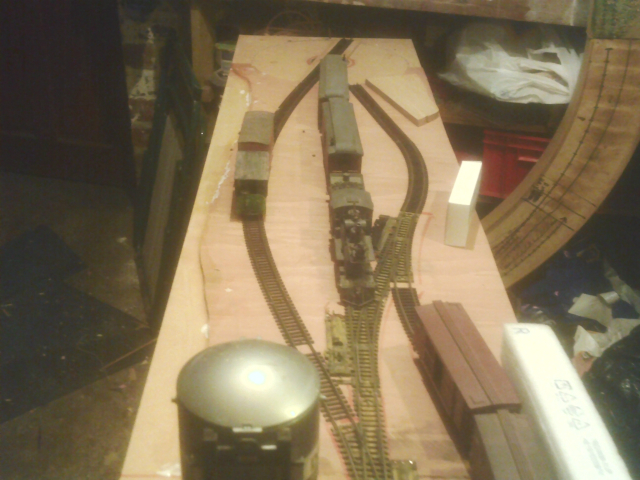 I've been ballasting the track on the upper level earlier this morning. Also adding grass, still many more hours pottering about with the scenery to do, but that's what pastimes are all about isn't it? PS - Apologies for some of the images being a bit fuzzy. My new camera is only a cheap one and it doesn't take nearly as good close ups as the other did. Bob, I always have problems with lightweight cameras, mainly due to camera movement. More me than the camera, but try putting it either on a proper tripod, or on a stable surface. Even sticking it to surface with bluetac might help. If it doesn't then it is the camera. Thanks for the suggestions. I've just been fiddling with it, trying to see if it has a self timer, and realised it was on a low resolution setting. I've upped the res and that seems to have solved the problem. I might have to read the instructions (but only if all else fails). 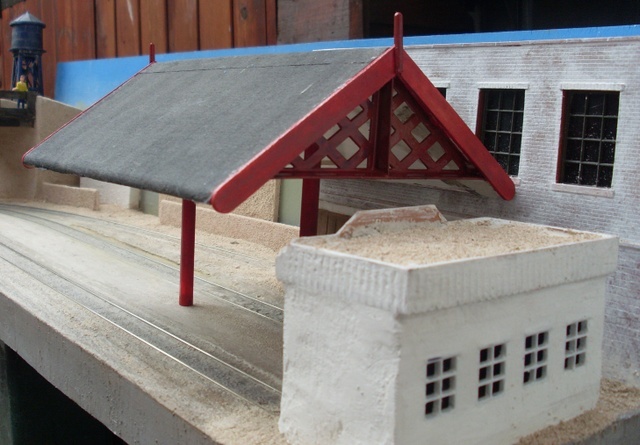 Meanwhile, the station building at Rio Paleta is being re-sited on the far side of the line so that I can add a detailed platform scene around it. It has been a while since I added anything to the FCPyF thread but I have not been idle during that time and I now have something more material than ideas to offer, hence this update. I have been planning an extension (Yeah, don't we all?) and discussing various ideas with Giles. At the Expo NG event in Swanley he very kindly donated three sets of points for the project. Since then I've been sketching plans using three turnouts and a turntable, the latter being essential for a steam hauled line such as the FCPyF. The final design was drawn up a week or so ago and I've been mulling it over before committing to nailing the track down. As Giles said, this "flows" nicely and I reckon it looks suitably colonial for the FCPyF. 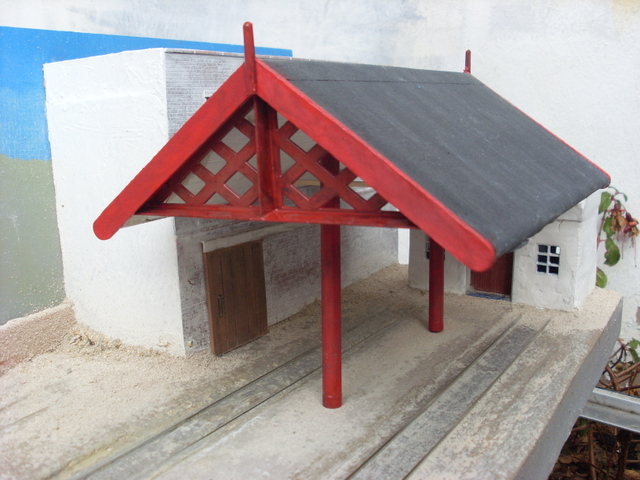 The turntable will be a gallows style bridge with a flooded pit, this latter feature being based on a turntable on the FCCA photographed after some heavy rainfall. It's not much to look at yet but I can see it in my mind's eye. 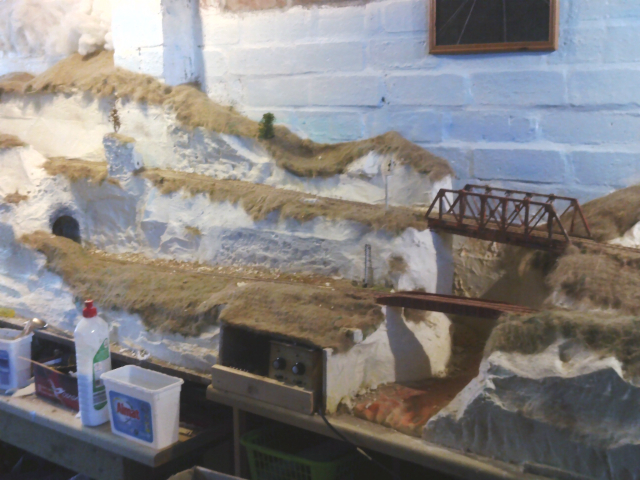 Cuarto de Pulgada is now attached to the garage wall above Charlie's layout. Support is provided by chains and a 2x2 batten. The baseboard is held in place by tent pegs through holes drilled into the batten. This means it can easily be moved should the urge to extend yet further become irresistible! If/when this happens CdP might get moved to a shelf above Centrales, thereby completing a full circuit of the garage. 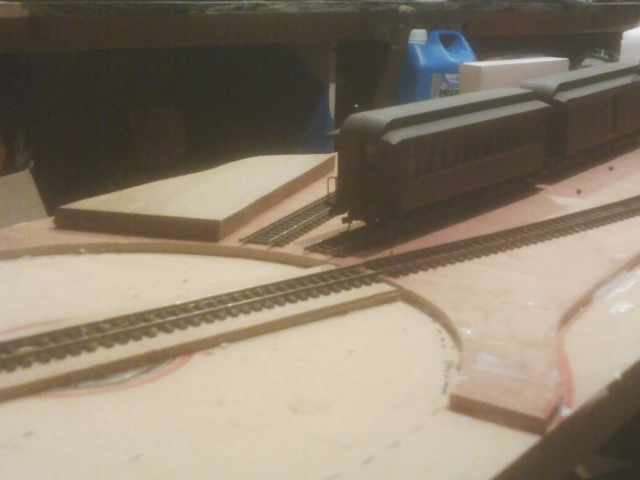 Alternatively the turntable could be replaced with points to complete the loops and CdP become a through station with the line extending beyond there either to a staging yard or dropping downhill to meet with the other end of the layout at Centrales, becoming a big roundy roundy! But that's just dreaming. First things first, get what's already there up and running. Then go back and complete the scenery between Centrales and Rio Paleta which is still a bit patchy in places. 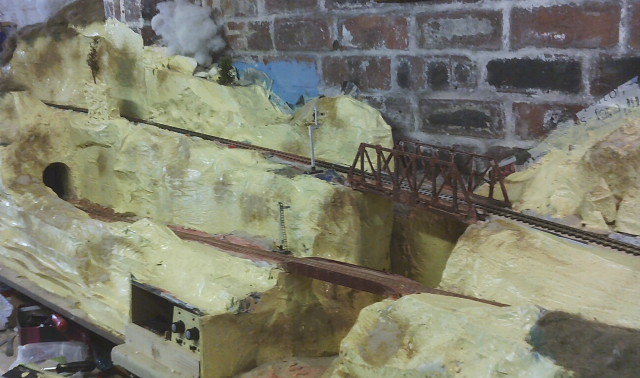 As of yesterday teatime the track laying is now complete. Power to the new extension is temporarily being fed via fishplates from Rio Paleta to Cumbre with the CdP local controller supplying power from there to Puente Casa but I still need to rig a feed via the bridge to CdP before trains can run the full length of the line. 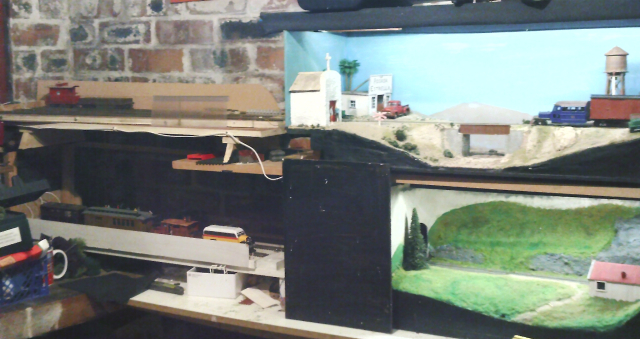 The modular heritage of the FCPyF can still be seen through the two scenes on the lower level. Of those only Frog Rock remains unaltered, Asilo having been rebuilt as Resurreccion. In theory these two scenes could still be classed as portable but this is academic because I have no means of transportation so they're going nowhere. 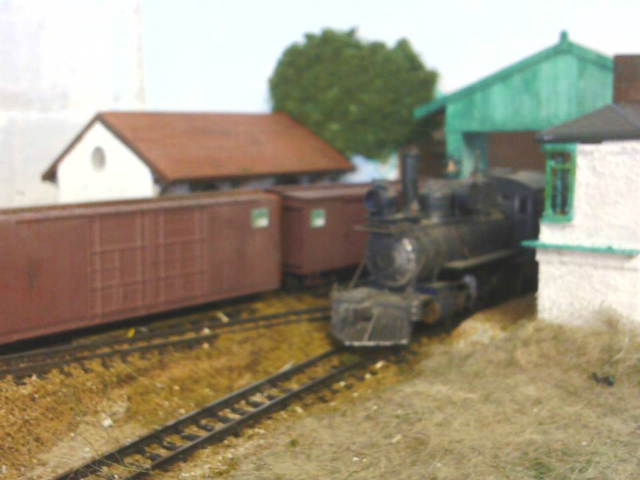 My other surviving Ferrocarril Internacional module, Rio Paleta, is still recognisable but now merged into a much larger scene on the upper level. I reckon that's my reputation as a small layout builder well and truly shot. * There are also three or four other FI modules still in existence but I think their owner has also incorporated them into a home-based layout instead of keeping them portable for exhibition use. Congratulations on the Golden Spike ceremony, Bob. Now for the Golden Spark ceremony and the inauguration of services to CdP. Already looking forward to the press photographs of the first train. Already looking forward to the press photographs of the first train. Funny you should mention that Giles, I was thinking about what to run as the first train while at work this morning. I reckon something from way back in the railway's history might be appropriate. Something pre-dating even the Ferrocarril Internacional period, something made for the original FCPyF micro-layout when I was just getting interested in On30. The new station at CdP has a lot more operating potential than the first one had, though there are times when I regret parting with the original. There is still a "heritage" loco, dating back to the original CdP, a Sierra Oculta version of the Titfield Thunderbolt. It has survived mainly because it was far too small (and fragile) for use on the Ferrocarril Internacional, so it got left at home when other stock went to exhibitions, and eventually got pushed right to the back of the railway cupboard where it was forgotten about. Looks to me like the Master of Micro Layouts has himself a Basement Empire..!! Ok, a Garage Empire, then, but none-the-less, an Empire!! Curiously the new shots of the original FCPyF terminus make it look smaller than some of the subsequent ones. Somehow with trains present, it looked larger. It was certainly the sight of it on Carl's website that started me thinking on what turned into Puerto Paseo. Heritage loco? Would that be the Bowker conversion, by any chance? If so, as with many heritage services, I think I see the need for a diesel helper at the back of the train to tackle the uphill run from Centrales.